This paper contributes to the understanding of empirically-oriented work on the size of government by integrating the analysis of three basic elements: (i) the 'demand' for government stemming in part from attempts to coercively redistribute, often analyzed in a median voter framework; (ii) the 'supply' of taxable activities emphasized in Leviathan and other models of taxation; and (iii) the distribution of 'political influence' when influence and economic interests are distinct. The role of the first two factors have been considered in recent empirical studies of government growth by Ferris and West (1996) and Kau and Rubin (2002). 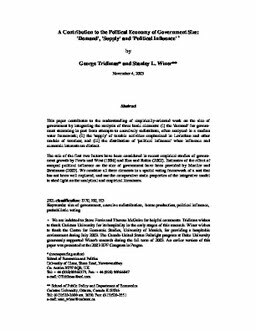 Estimates of the effect of unequal political influence on the size of government have been provided by Mueller and Stratmann (2003). We combine all three elements in a spatial voting framework of a sort that has not been well explored, and use the comparative static properties of the integrative model to shed light on the analytical and empirical literatures. Tridimas, George, & Winer, S. (2003). A Contribution to the Political Economy of Government Size: ‘Demand’, ‘Supply’, and ‘Political Influence’ (No. CEP 04-04). Carleton Economic Papers (CEP). Department of Economics.